Samuel Langhorne Clemens, better known to the world as Mark Twain, was a man of many talents: writing, speaking, mustache-sporting, to name a few. 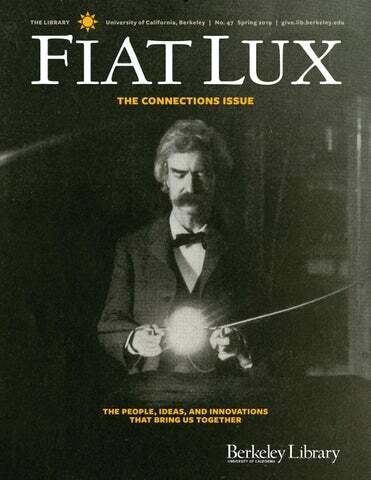 On the cover, Mark Twain holds a loop of wire through which high-voltage currents flow, sparking incandescence. He is photographed in Nikola Tesla’s laboratory in 1894. At left, Twain sits in the library of his Redding, Connecticut, home, in 1908. Below, from left to right, are an 1898 letter from Twain to Tesla; an 1881 letter from Ulysses S. Grant to Twain; and the envelope for a 1905 letter from Helen Keller to Twain. Images and letters are pulled from the Mark Twain Papers and Project, housed in The Bancroft Library. “The letters and notebooks and autobiography, all of those things are evidence of what (Twain) is thinking and feeling and doing throughout a long and very busy life,” says Bob Hirst, general editor of the project. © THE REGENTS OF THE UNIVERSITY OF CALIFORNIA, THE MARK TWAIN PAPERS AND PROJECT, THE BANCROFT LIBRARY, UNIVERSITY OF CALIFORNIA, BERKELEY. 6 DEGREES OF MARK TWAIN Frederick Douglass On Sept. 3, 1838, Frederick Douglass boarded a train en route to a new life. He was sheltered by Jervis and Olivia Langdon, whose home serviced the Underground Railroad. Years later, Twain married the Langdons’ daughter, Livy, entwining himself with the family’s rich circle of friends, including Douglass. After Jervis Langdon died in 1870, Douglass wrote a letter, at right, to Olivia Langdon: “If I had never seen nor heard of Mr Langdon since the days that you and himself made me welcome under your roof in Millport, I should never have forgotten either of you. Those were times of ineffaceable memories, ... and I have carried the name of Jervis Langdon with me ever since.” Douglass was a writer, orator, and activist. In 1881, Twain wrote to President James Garfield, requesting he keep Douglass in government: “I offer this petition with peculiar pleasure & strong desire, because I so honor this man’s high & blemishless character & so admire his brave long crusade for the liberties & elevation of his race. He is a personal friend of mine, but that is nothing to the point — his history would move me to say these things, without that.” Frederick Douglass was born into slavery in Talbot County, Maryland, sometime around 1818. After years of abuse and several failed attempts, Douglass, disguised as a free sailor, made his escape. Nikola Tesla “An inventor is a poet — a true poet,” writes Twain in an 1870 letter. Twain maintained a lifelong enchantment with invention, to him an art form of the highest order. The fascination led him to the Serbian inventor Nikola Tesla, who would invite Twain to take part in his experiments. (In one instance, Twain stood on a vibrating plate that Tesla said would relieve Twain’s digestive blocks; moments later, Twain jumped off the platform, running for the bathroom.) Twain’s own artistry also meant a great deal to Tesla, who was often sick as a child. He found healing in books: “One day I was handed a few volumes of new literature unlike anything I had ever read before and so captivating as to make me utterly forget my hopeless state,” writes Tesla in his autobiography. “They were the earlier works of Mark Twain. … (W)hen I met Mr. Clemens and we formed a friendship between us, I told him of the experience and was amazed to see that great man of laughter burst into tears.” Nikola Tesla, father of the alternating current, emigrated from Croatia to New York in 1884. At left, Twain is photographed in Tesla’s lab, with Tesla blurred at center. Helen Keller If magic exists, it is in the radiant friendship between Twain and Helen Keller. “She is fellow to Caesar, Alexander, Napoleon, Homer, Shakespeare, and the rest of the immortals,” Twain writes in his autobiography. “It has taken all the ages to produce a Helen Keller.” In 1907, Keller visited Twain’s home, where his secretary, Isabel Lyon, performed on the orchestrelle, a kind of organ. “Helen’s face flushed and brightened on the instant, and the waves of delighted emotion began to sweep across it,” Twain writes. “Her hands … sprang into action at once, like a conductor’s, and began to beat the time and follow the rhythm.” Blind and deaf since infancy, Keller could, according to Twain, “see without eyes, hear without ears.” On Twain’s 70th birthday, Keller wrote, “You will accept my little handful of flowers gathered in the garden of my heart, will you not? They are not intended so much for the great author whom the world has crowned with its choicest blossoms as for the kind, sympathetic, noble man, the best of friends.” Helen Keller lost the ability to see and hear when she was a baby. Mentored closely by Anne Sullivan, Keller, pictured here, became a noted author and tireless activist for disability rights. Ulysses S. Grant For all of Twain’s financial faux pas, he was still more shrewd a businessman than at least one person: Ulysses S. Grant. By 1883, Grant had lost his fortune in bad investments. Worried for his family’s welfare, Grant sold several war articles to The Century Magazine, giving away the first for $500 — much to Twain’s horror. “To offer General Grant $500 for a magazine article was not only the monumental insult of the nineteenth century, but of all centuries,” Twain writes in his autobiography. Twain convinced Grant to release a memoir with Twain’s publishing house, but the two quibbled over royalty payments, each refusing to profit at the other’s expense. “He would not listen to terms which would place my money at risk & leave his protected — the thought plainly gave him a kind pain,” Twain writes to Henry Ward Beecher, Harriet Beecher Stowe’s brother, in a letter, at right. (The book sold swiftly, earning both men plenty.) Grant finished the memoir while dying. In the letter to Beecher, who was preparing the eulogy, Twain calls Grant “the most lovable great child in the world.” Ulysses S. Grant was the president of the United States from 1869 to 1877. He was a celebrated Union general in the Civil War and, as president, fought to prosecute the Ku Klux Klan and rebuild the South. To learn more about how you can support the Mark Twain Papers and Project, contact the Library Development Office at 510-642-9377 or give@library.berkeley.edu. One foot in front of another — slowly. Under your feet, a steel girder 6 inches wide juts out from a skyscraper into the void. Leagues beneath you, cars honk vaguely. Arms outstretched, you inch forward. You remove the virtual reality headset and take a breath. You are safe on campus. “It’s bizarre, because you know, ‘OK, I’m just standing here with a headset on,’ ” says Madison Hight ’18. “But your brain is like, ‘No, you are 300 feet up in the sky.’ ” Hight is the external vice president of VR@Berkeley, a student club ushering 150 students into the universe of virtual reality, or VR. The students, hailing from fields such as journalism, music, and cognitive science, are developing cuttingedge technologies that can not only put users in a new world, but give them tools to control their own. According to Hight, VR@Berkeley is the largest collegiate virtual reality club in the country. The students develop tools for labs and companies across the Bay Area. But for now, they share only two high-powered computers and a patchwork of meeting spaces scattered across campus. The students teach a VR course every semester, but they recently lost their classroom space. They have the passion, the people, the ideas — but no place to put them. Meanwhile, the Library is gearing up for the next stage of Moffitt Library’s transformation into the Center for Connected Learning — a multidisciplinary hub where students can explore new ways of thinking and making. There, the Library aims to build a space for virtual reality — and for the students trying to change the world, a home. In virtual reality, a user wears a headset that hijacks the senses, transporting the person to a new environment. Its sister, augmented reality, or AR, is an offshoot that keeps a person rooted in the real world, but introduces new elements via digital overlay. The two are often called AR/VR. Madison Hight ’18 plays a virtual reality game in Cory Hall. “Everything I learned at Berkeley came together in VR,” she says. much bigger problems … and contribute to the larger society.” For Hight, the driving question is: How do you create an experience that can improve people’s lives? “We’re very much on the tip of an iceberg, and we don’t have a complete idea of what the technology can be used for,” says Bryan Tong, president of the club. “There’s still something left to be discovered.” For John Maccabee, a Library Board member, that’s exactly where the Center for Connected Learning fits in — as a springboard for that kind of discovery. “These kinds of games embody what a library is capable of doing,” says Maccabee, who has been designing games for 12 years and has dabbled in AR/VR. “When I was growing up, it was either books or microforms, and now it’s everything.” According to Jean Ferguson, learning and research communities librarian, the Library is now working with members of the club to blueprint spaces in Moffitt that can better accommodate AR/VR. The Library currently plans to stock the Center for Connected Learning with a cluster of high-powered computers and a sound booth. “At the end of the day, what you are doing in a virtual reality environment is just exploring and learning in a new way,” Ferguson says. With space in the library, VR@Berkeley will have room to explore and learn to no end. “The capabilities that having a dedicated space would bring and allow us to give back to the school are immeasurable,” Tong says. “That’s our biggest bottleneck, and once that bottleneck is solved, we’ll have so many project teams that can go on and do bigger things.” P To learn more about how you can support the Center for Connected Learning at Moffitt Library, contact the Library Development Office at 510-642-9377 or give@library.berkeley.edu. reputation for cracking even the most difficult of cases, earning nicknames such as “The Wizard of Berkeley,” “The Edison of Crime Detection,” and “The American Sherlock Holmes.” (Heinrich died in 1953, and his son Mortimer gifted his father’s collection to The Bancroft Library in 1969.) Every Friday over the past year or so, Michels, head of archival processing at Bancroft, has cataloged Heinrich’s collection one folder — one scrap of paper, one photograph, one yellowed newspaper clipping — at a time. All told, the collection (now available at Bancroft to researchers) spans nearly 150 linear feet of materials, including photographs, diaries, notes, correspondence, and pieces of evidence that shed light on some of the most notorious criminal cases of the time. “There’s no collection like this in the country,” Michels says. At top, Lara Michels, head of archival processing at The Bancroft Library, talks about her work on the collection of Edward Oscar Heinrich. Heinrich, seen at bottom left working in his lab, built his reputation on his extreme attention to detail and his cutting-edge techniques. Heinrich ran a lab out of his home, on Oxford Street in Berkeley. At bottom right, items in the collection include Heinrich’s notes and a small handgun. E BANCROFT LIBRARY, EDWARD OSCAR HEINRICH PAPERS, BANC MSS 68/34 C, CARTON 82:13. Heinrich built his reputation on his attention to detail, his cutting-edge techniques, and an uncanny ability to reconstruct a case by relying on mere whispers of physical evidence. “He was just super, super meticulous,” Michels says. Materials in Heinrich’s collection include a wanted poster and crime scene photographs from the famous botched robbery of a Southern Pacific Railroad train in Oregon. In October of 1923, the DeAutremont brothers — two twins and a younger sibling, all armed — boarded an express train heading south through the Siskiyou Mountains. With gunshots and a dynamite blast at the mail car’s door, the DeAutremonts killed four people. Although they emerged emptyhanded, the brothers left a key piece of evidence: denim overalls, which were sent to Heinrich for analysis. In his examination, Heinrich extracted an impressive amount of information about the suspect who wore the overalls, including that he was a white, fastidious, left-handed lumberjack, between 21 and 25 years old, weighing about 165 pounds and no taller than 5 feet, 10 inches. (According to Eugene Block’s book The Wizard of Berkeley, Heinrich determined the suspect was left-handed because of the wood chips in the right pocket; a southpaw would have his right side facing the tree he was chopping.) In addition to other clues, including purchase records and a signature (Heinrich was a self-taught expert in handwriting analysis), the DeAutremont brothers became suspects. The worldwide manhunt that ensued ultimately led to the brothers’ arrest and imprisonment. To learn more about how you can support the acquisition, preservation, and processing of rare collections, contact the Library Development Office at 510-642-9377 or give@library.berkeley.edu. Amy Neeser, consulting and outreach lead for Research IT, helped create the Library’s new data program. A team of women pluck tea leaves from an estate in Wayanad, Kerala, India, in April of 2017. The image is part of the fieldwork of Manaswini Rao, a graduate student in the campus’s Department of Agricultural and Resource Economics. Rao is studying the role of gender in agricultural labor and uses employment data from the National Survey Sample, provided by the Library through its Data Acquisition and Access Program. Author Vikram Chandra, left, author Annie Barrows, center, and host Dave Duer speak at the Luncheon in the Library event in Doe Library. AUTHORS TALK NETFLIX AND NOVELS AT LUNCHEON On paper and on the screen, they couldn’t be more different. One is a novel about love — for people and for stories — set against the backdrop of a Nazi-occupied island in the English Channel after World War II. The other, a sprawling, decadespanning tale of crime and corruption in Mumbai. But at this year’s Luncheon in the Library, authors Annie Barrows ’84 and Vikram Chandra united onstage for a genre-crossing conversation about their books, their craft, and what it was like to see their respective novels leap from page to screen. Chandra is the author of 2006’s Sacred Games, and Barrows co-wrote, with her late aunt Mary Ann Shaffer, 2008’s The Guernsey Literary and Potato Peel Pie Society. (The full first season of Sacred Games, Netflix’s first original Indian series, was released in July, and the film version of Guernsey began streaming in August.) Among the 230 people who came to Doe Library for the luncheon was Taylor Follett ’19, literatures and digital humanities student assistant at the Library and an undergraduate at Berkeley. “I’ve never heard authors talk about how their writing becomes a movie or a series,” she said. “I thought it was really, really cool.” Plus, she said, “I love that it was in the Library.” P The Luncheon in the Library is an invitation-only event honoring Library supporters, and features a different guest speaker each year. 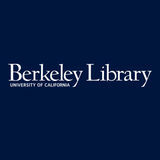 To learn more, contact the Library Development Office at 510-642-9377 or give@library.berkeley.edu. How do we thank thee? Let us count the (25) ways. In February, supporters gathered for an exclusive viewing of eye-popping artists’ books in the Environmental Design Library — a special event for the Library Legacy Circle of The Benjamin Ide Wheeler Society. Each year, the Library unearths treasures from one of its 25 branches to celebrate the group, whose members have included the Library in their bequest plans. At the event, guests flipped through the library’s collection of artists’ books, including a copy of H.G. Wells’ The Invisible Man, in which every letter has been laser-cut except for the ending (when the invisible man reappears); a rendering of Italo Calvino’s city of Baucis, carved into an atlas book; and a leather-bound volume framed by two redwood blocks holding a split rock. “It’s through the generous bequests of people like (members of the Legacy Circle) that these types of materials are available,” said David Eifler, environmental design librarian. Mildred Sheehan looks at an artist’s book in the Environmental Design Library during a Library Legacy Circle event. To learn more about the Library Legacy Circle, contact the Library Development Office at 510-642-9377 or give@library.berkeley.edu. Correction: Mr. Edward Gordon and John and Jennifer Spahr were omitted from the UC Berkeley Library Honor Roll as part of the Robert Gordon Sproul Donor Club. We regret this error. From left, activists Charles Brown, Ysidro Macias, LaNada Means, and Stan Kadani march down Bancroft Way in Berkeley. To learn how the Library supports the university’s goal to advance and expand diversity through exhibits and other educational programs, contact the Library Development Office at 510-642-9377 or give@library.berkeley.edu. The connections issue. We explore the people, ideas, and innovations that bring us together.